National Weather Service chart shows forecast high temperatures for Tuesday. Temperatures in San Diego County’s deserts could soar as high as 122 degrees Tuesday and Wednesday as the heat wave roasting Southern California peaks. A National Weather Service excessive heat warning for the deserts will remain in effect until 9 p.m. Thursday. A less severe heat advisory for the valleys and mountain areas with altitudes lower than 5,000 feet will expire at 9 p.m. Wednesday. 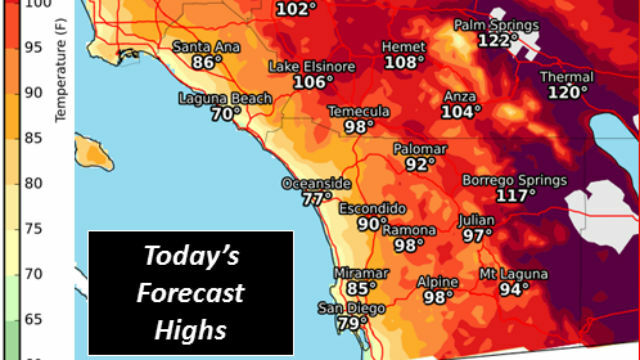 Predicted high temperatures Tuesday are 82 to 87 degrees in inland coastal areas, 86 to 91 degrees in the western valleys, 98 to 103 degrees near the foothills, 97 to 107 degrees in the mountains and 117 to 122 degrees in the deserts. Temperatures on Wednesday are expected to range from 83 to 88 degrees inland, 87 to 92 degrees in the western valleys, 98 to 103 degrees near the foothills, 98 to 107 degrees in the mountains and 117 to 122 degrees in the deserts, according to the weather service. Somewhat cooler conditions are expected Thursday and Friday. The beaches were not included under the heat advisory, but those looking to beat the heat will have to contend with strong and potentially dangerous rip and longshore currents. A beach hazards statement will remain in effect through Thursday evening. The hot weather will increase the risk of heat-related illness and anyone working or spending time outdoors would be more susceptible, as will the elderly, children and those unaccustomed to the heat. Forecasters advised residents to reschedule strenuous activities to early morning or evening, drink plenty of water, wear lightweight and loose fitting clothing and be aware of the signs and symptoms of heat exhaustion and heat stroke. Authorities also warned against leaving children, seniors or pets in parked cars, which can heat up to lethal levels in just minutes, even with a window partially open.